I came up with this addon while working on my recent project. "Export to FBX" button allows to export models to FBX with proper transformation and preserved smoothing groups. It also sets the pivot on the lowest vertex and provides the possibility to export as one file or multiple files. 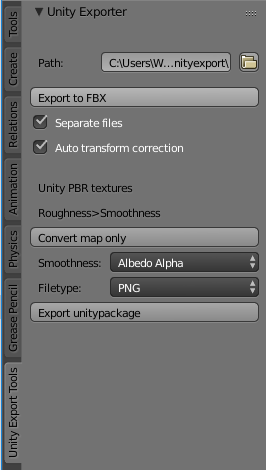 "Export texture set" button converts Roughness map to Smoothness as Base Color or Metallic alpha channel. Converting Roughness to Smoothness requiers a lot of calculations and it's a time consuming task (approximately 30 seconds for 4k texture) so don't worry if Blender will look like it stuck. Vuk Gardašević (lijenstina) triaged this task as Normal priority.